On Friday, I dragged myself out of my self-imposed winter hibernation for a trip into London. On the agenda – dinner, Sara Pascoe at the Wyndhams Theatre, and light installations. This is the third time I’ve seen Sara, and further continuation of realising how much I identify with her which I first realised after seeing her in 2016. Admittedly there was slightly less for me to hook into in LadsLadsLads as the show started with the break-up of her last relationship but there was still plenty of “THAT’S ME!” moments even down to her pre-gig/interval music which was basically my Spotify playlist). There was such an intimacy to her show which I can imagine some people would feel uncomfortable with, and there was certainly some awkward laughter from some of the audience. At one point, she said there was only two reasons to stand up in front of people – if you make them laugh, that’s comedy but if you don’t, it’s a TED talk but I really felt like Sara’s show was both – when she wasn’t offering funny insights, she was giving us thoughtful comments, all interwoven into a story with multiple call backs. I adore a comedian that gives me a fully-fleshed story alongside the giggles. I also want to commend her spectacular heckler management. I despise idiots who make unsolicited noises in gigs whether positive or negative, and I cringed every time this idiot woman whooped. It’s so selfish and I will never understand it. Sara has perfected the art of a perfect withering look though. An interesting angle for me (and probably loads of others as well), is that I’ll be hearing the other side of the break-up when I see her ex-boyfriend in a couple of weeks. Based on the fact that I almost cried on a number of occasions in Sara’s set, I’m already preparing myself emotionally for that. After the show, Tim and I searched out some light installations from Lumiere London. I’ve missed it on previous years, and only saw a small bit of this year but it’s better than nothing! We down the South Bank and saw OSC-L, Light on Their Feet, and possibly others too but my favourite was Vertigo by Danish Company The Wave. I didn’t have my camera on me so all my shots are appalling, but I loved walking through the triangular tunnel. It’s a real shame Lumiere is only on for the weekend as it would have been great to see it in daylight as well. December 2017 will be remembered as the month I sat around feeling sorry for myself. The last post I made was about how I thought I had bronchitis – apparently, it’s “just” a cough, albeit a cough which made me actually vomit during a meeting at work (oh god, the shame). Just when I thought it was getting better, I then picked up another cold which has made my cough worse again, so spent the week between Christmas and New Year’s on the sofa. It’s so ridiculous and pathetic – I’m normally such a well person, so I can’t really understand why I’m so run down. At least I have another week off work for more lying around feeling sorry for myself. There were some highlights in December though. The perfect timing for some Christmas gifts, I met up with an old friend to visit the Crafty Fox market which was held at the Mercato Metropolitano which is just gorgeous. 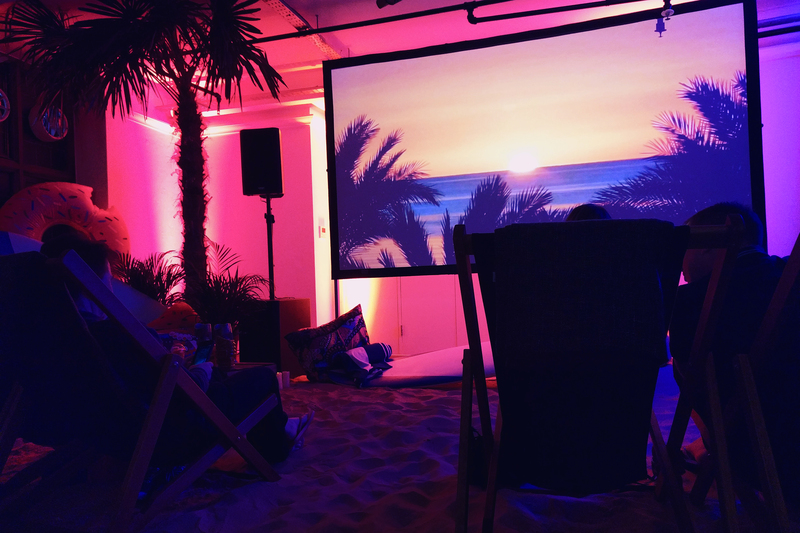 I wish I had another reason to visit Elephant and Castle – they currently have a Backyard Cinema there but I think they’re mostly booked up. As for the market, I managed to get a lot of gifts there, and some fun things for myself. I do love a Craft Fox event. I normally blog about this weekly, but I just did not have the energy. It was packed with all the usual goodies, with some new items like the iconic Brazilian Bum Bum Cream and QMS Medicosmetics. It does feel like a lot more items have gone to my Mum than in previous years, so maybe this one hasn’t been as good? Still enjoyable though. I mentioned last year that Christmas has become incredibly difficult for me to cope with but circumstances this year meant I was able to have a very quiet Christmas day with both my in-laws and my Mum (and Husband of course). We didn’t go insane with gifts or anything like that – the commercialism of the holiday is getting truly ridiculous and makes me feel quite uncomfortable at times. That said, I did get the latest Mr Jones Watch for my collection which I was incredibly grateful for. It was a very relaxed and peaceful day with wonderful food and good company. We got addicted to Dark, the first German language series on Netflix. It blew my mind – the level of detail, the intricacies of the many stories being told. On several occasions, a reveal happened on screen but the implications of it wouldn’t hit me for a while. This meant I frequently turned to Husband at random moments and screamed excitedly at him. Cannot wait for series 2. My Mum had my niece for a couple of days over the Christmas break, so we decided to take her on her first trip to London. On the itinerary – Liberty, Carnaby Street, and of course Hamleys. She was a little overwhelmed when we first stepped into the famous toy store, but as soon as she saw Peppa Pig cuddly toys, she figured out that this was her shop. It was very adorable seeing her excitedly spotting different things, and I managed to convince her to get a Supergirl doll (they didn’t have Wonder Woman). Walking round the busy streets with her yelling at people to get out of the way is a memory I’ll cherish! Two years ago, almost to the day, we went on the most amazing tour of the Southbank Centre. It involved donning high vis vests to visit closed off spaces and I loved it – an absolute highlight of 2015. I can’t even remember why I was on the Southbank Centre website a few weeks back, but I noticed that they were advertising more tours and being the efficient nerds we are, Tim and I decided to combine this with a backstage tour of the National Theatre. What an excellent Saturday. We met our guide in a very peaceful National Theatre foyer where we were immediately given high vis vests again. YES! I now know this to be the hallmark of a brilliant tour. There were about 10/15 people on the tour, a mixture of ages, quite a few Americans, but a nice respectful bunch who asked (mostly) sensible questions. After hearing a bit about the history, we were taken into the back of the Olivier theatre, where crew members were going through a tech rehearsal. I did try to make an effort in listening to the wonderful tour guide as she talked about the drum revolve and the fly tower, but it was so fascinating seeing the action on the stage. It’s a beautiful theatre and brought back great memories of seeing Everyman there a few years ago. From the Olivier, we went over to the Lyttelton theatre which was all set up for Jane Eyre. It’s really odd being in a brightly lit and empty theatre, but you really get to experience the venue, rather than the performance. We were taken around the back of the stage (where the photo at the top was taken from), saw the props all laid out, costumes hanging up, and a Henry Hoover ready to go. From there, we walked down the main ‘road’ behind the stages, visited the carpenters shop, and peered down into the props department from the walkway. Even though it was a Saturday, staff were still busy at work creating amazing sets and props, including very realistic looking pizza. The final part of the tour took us through the offices and dressing rooms, where we saw Bryan Cranston’s name on a door, reminding Tim that he has tickets to see Network, and enabling me to snag his spare ticket. Back to the Olivier I will go in January. The second tour of the day was the architecture tour of the Southbank Centre, sadly without high vis jacket. The tour mainly took us around the public areas so it didn’t really add much to the one we did a couple of years ago although we did get to go into the empty Royal Festival Hall where some musicians were hauling instruments on stage for that night’s performance. What a treat. I was able to boast about my stay at A Room for London which I am always happy to do for a willing audience (can’t do it enough to be honest) but the rest of the tour wasn’t ‘backstagey’ enough for me. They do have a bunch more tours scheduled for the rest of the year, so hopefully I’ll have a chance to go on the actual behind the scenes tour. After we said goodbye to our tour guide, we went back to the National Theatre to try to catch a glimpse of something referenced on our tour. We were told that the dressing rooms have windows that overlook a private courtyard and on press night, the actors all stand at their windows banged on the glass as part of a longstanding tradition. According to the guide, you can just about see the courtyard from one of the outdoor terraces. Off we scampered, and whilst we didn’t find the courtyard, we did find a secluded garden, great views over the south bank (and also people trying to work with two idiots running around outside). Every time I visit the Southbank, I discover something new. For someone with only two wrists, I sure do have a lot of Mr Jones Watches. I wrote about number one here. And numbers two and three here. Covered off four, five, and six on one busy day last year. Quickly followed up with number seven. It seems very fitting that 2017 has been the year where I’ve reached number ten as it is also the year of their 10th birthday. I sadly wasn’t able to make it to their exhibition and birthday party as I was in New York, so I decided to celebrate in my own way – by cracking out the debit card. Number eight was acquired a few months ago as Husband treated me to a limited edition Dog watch. I got number 15 (I can’t resist a numbered watch), and I love the super cute strap. More pink stitching please, Mr Jones! Number nine was another gift from Husband. The beautiful Nuage designed by Marion Labbaz is another limited edition which sold really quickly – whilst I was debating whether or not to buy it, Husband visited the shop and picked up number 38 for me. Nuage has now made it to the permanent collection, but I’m so pleased to have one of the originals. And ta-da – number ten! I’ve had my eye on Colour Venn since it was released, and snapped it up in recent 24 hour sale without a second thought. It’s my current favourite, although the yellow ‘second’ hand is very distracting in meetings. So happy birthday Mr Jones Watches. Can’t wait to see what you create next. I started July in New York which was as wonderful as ever, continued with two average weeks, and finished with a week alone as Husband is away at a work trip. He’s off in South Africa seeing giraffes and elephants, whilst I’m sat feeling sorry for myself on the sofa. New York in the summer is a very different city to New York in winter, but we had an awesome time, as it evidenced by my many blogs on the topic. Still feeling a bit jet lagged, I went to Hampton Court with my Mum a couple of days after getting back from NY. Flower of the show this year seemed to be the echinacea which I had just seen on the High Line, so I needed some of those for my garden. It was insanely hot and really crowded, but we did get to see lots of pretty flowers. Guys, have you heard of this thing called Netflix? It’s got TV shows and films… and OK so I’m very behind on this but with Husband away, I got myself a free trial. I’ve started on Riverdale but have mostly been mainlining How I Met Your Mother. I am so modern. I had some additional leave to take at work, so booked in an Elemis facial and Aveda hair cut last week. Unfortunately, my two days of me time started with a horrific hour in the dentist chair – god lord, I have never experienced anything like it. And it seemed relentless. I felt really bad for bursting into sobs as my dentist went into overdrive with apologies, and I did make him feel quite guilty but it was just awful! Fortunately, the facial and hair cut were 100% less stressful. Very much needed. With Husband away, my Mum challenged me to find a nice, reasonably priced hotel in London so we could do a bit of shopping. I found the Hilton Bankside which was super nice with gorgeous decor, and just behind the Tate Modern which is one of my favourite areas of London. We spent the afternoon getting absolutely drenched, followed by a relaxing Bobbi Brown make-up lesson at Liberty, and then dinner in the hotel. If you’re looking for somewhere reasonable to stay in London, I highly recommend it. 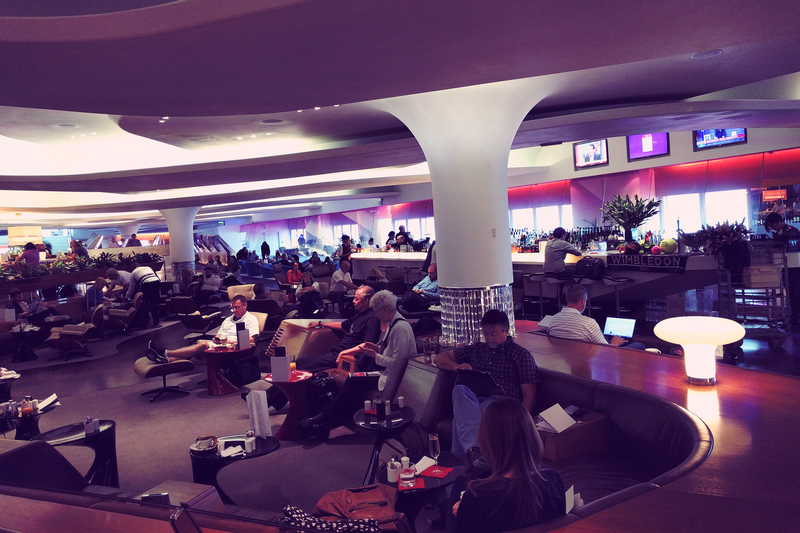 I am not ashamed to admit that flying Virgin Atlantic Upper Class is one of the best holiday experiences I’ve ever had. 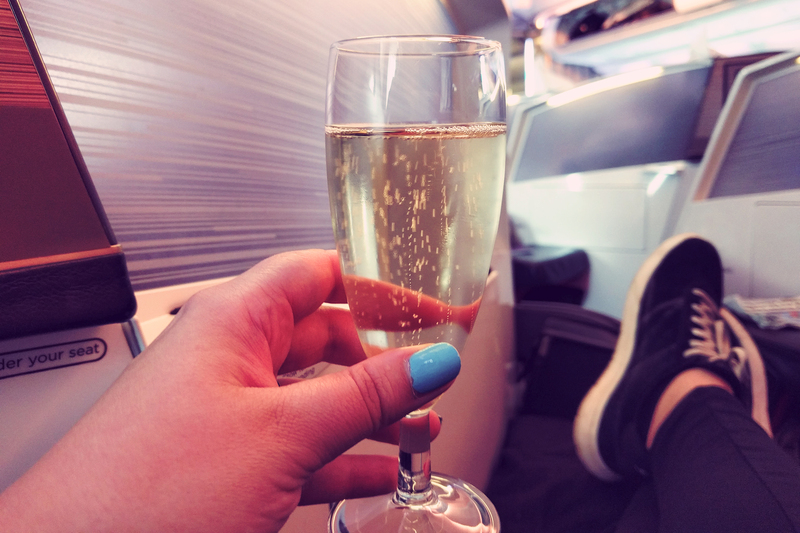 We were incredibly fortunate to be in a position to upgrade both to New York and back, so were able to check out the view from an Airbus A330 and Boeing 787 Dreamliner (my favourite plane), as well as sample cocktails in both the Heathrow and JFK Clubhouses. Check in at Heathrow was a bit stressful – we didn’t use the Upper Class Wing, and joined a bit of a scrum at the normal check in which felt like it took forever. The “private security channel” wasn’t actually worth it as it was going slower than the main security line, but it does look as though they’re in the middle of renovating that area. By the time we got to the Clubhouse, I was a little frazzled. A Clubhouse that was rammed, but we managed to find a quiet spot next to a window. I remember Rach talking about the spa, so went over to get an appointment – they had one spot left for a Bumble and Bumble reconditioning treatment which would be cutting it a bit fine for my flight, but I was assured that it wouldn’t be a problem. Whilst waiting for my treatment, we had some breakfast and I wandered about to see what else the Clubhouse had to offer (we weren’t actually given a tour when we got there). There’s a deli area, bar, pool table, half-finished TV room, and the most gorgeous tiles in the bathrooms. I might have taken a photo for bathroom renovation inspiration. The hair treatment itself was free so I’m not complaining but… The two women in the salon before me had insanely long hair which they were getting straightened and curled (each, not both at the same time obviously), which meant that my appointment was 10 minutes late. It was a great treatment and my hair felt gorgeous afterwards, but Husband was waiting for me as I left the salon because our flight was already on it’s final call. We almost had to sprint to the gate, which of course was the gate furthest from the lounge, so all that nice relaxing was ruined! Our experience at JFK was a million times better, starting with the dedicated check in desk in a quieter area of the airport (although security still took an age). 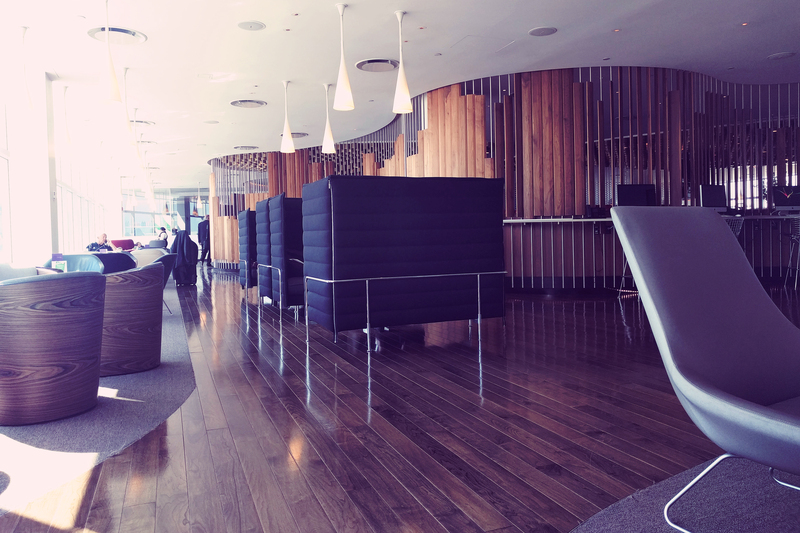 The JFK Clubhouse is a smaller lounge, but I loved it as it didn’t feel busy at all. We sat in a sofa pod where I almost fell asleep because it was so comfortable and just so quiet. The service was impeccable, and we felt truly looked after – that might have been because our waiter checked up on us frequently to make sure we were stocked up on cocktails. It was almost a “thank you, Linus” situation. I ended up having the same Bumble and Bumble treatment as before, but was able to enjoy it this time as I didn’t have to rush off afterwards. I really don’t think my hair has ever felt or looked as good. Not only that, but the luxurious Clubhouse showers were an absolute godsend after walking round a hot Midtown all day. The flights were amazing – I mean, how could they not be when there’s a bar on board? The Airbus was a little older, a bit scuffed and chipped with the 1-2-1 configuration. Husband preferred this – the seat dividers were higher than the newer 1-1-1 layout on the Dreamliner so he didn’t have a nosy American peering at his dinner (unlike our second flight). The Herschel amenity kits are very cool so we now have two different Herschel toiletry bags each, and I of course kept my Virgin Atlantic PJs. 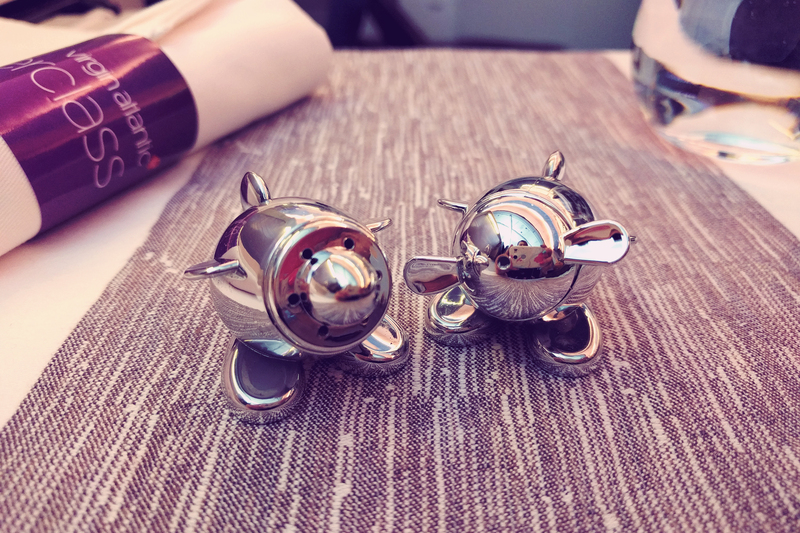 The salt and pepper shakers might have found their way home with me as well. I tried the lie flat bed on the Dreamliner for about 45 minutes, but it was just too hot to sleep with the duvet so I sat up and kept watching TV. I did nap for a bit longer, but I was absolutely roasting and I only had a sleeveless top and thin leggings on – I didn’t dare try the long sleeved PJs as I think I would have melted. It was a shame that I couldn’t make more of the bed, but the chair was just as comfortable. The main negative from the whole thing was that the flights were only 6/7 hours long – I could have stayed on there for hours (I’ve just checked the price on the longer Miami flight – yeesh! That’s not going to happen). Oh, and the scrambled egg was the most hateful thing I have ever eaten – I don’t know why I thought they could make decent eggs on a plane. Premium economy just doesn’t compare though, so now I’ve just got to hope that the upgrade gods smile on us and I get to experience it all again. What an absolute joy. 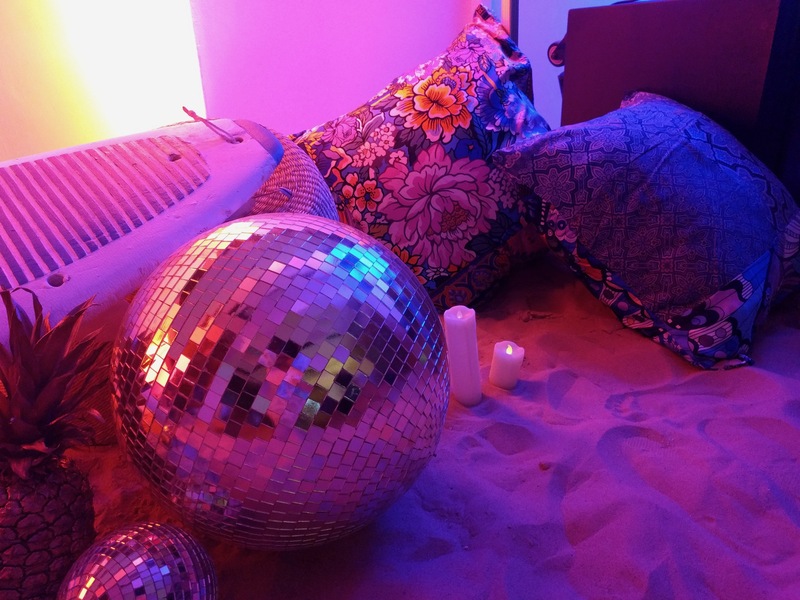 I hope that one day, I’m asked where’s the weirdest place I’ve watched a film (a common question), because after this week, I’ll be able to say in a sand filled room on the fourth floor of Liberty. I haven’t really got into the whole pop-up immersive cinema scene. I’ve seen friends get all dressed up to see Star Wars or Back to the Future and thought “meh, seems like a lot of effort to me”. I love comfort, so sitting on a rug on the floor whilst straining my neck to see the screen doesn’t scream fun for me. 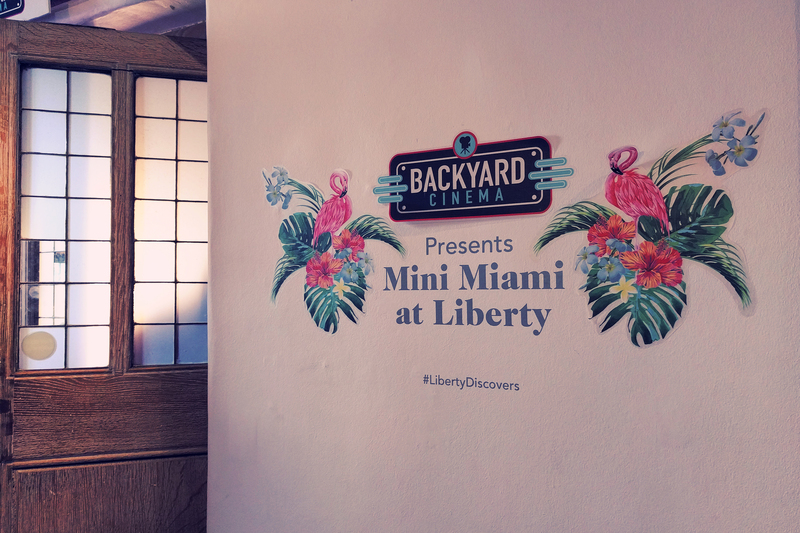 However, something about the Backyard Cinema screenings at Liberty appealed to me. 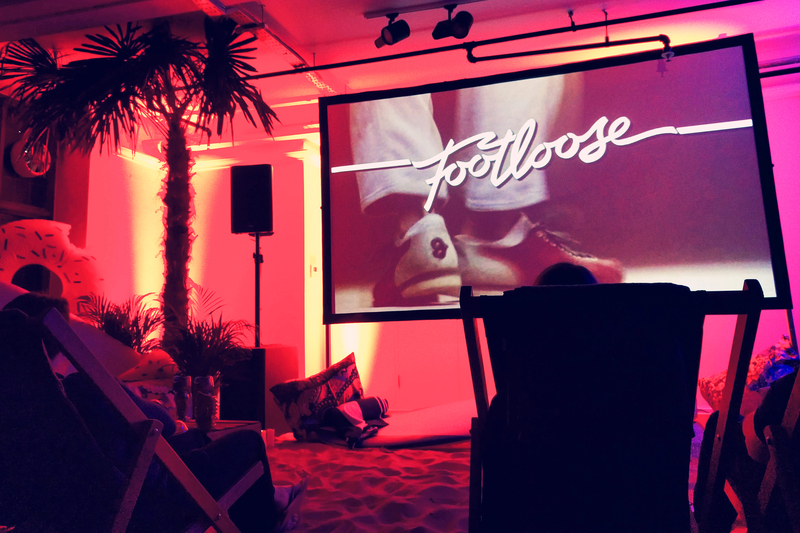 It might have been the Miami theme (considering my recent visit), it might have been that it was being held in my favourite store, or it could have been the brilliant selection of films. We’ll never know. The whole summer, Backyard Cinema is based at the Mercato Metropolitano in South London, a place I have yet to visit but looks amazing. They’re showing some absolute classics there – new and old, children’s, comedy, action – all sorts. And as a little offshoot to their summer season, they set up shop in the Disappearing Store on 4 at Liberty. Tim and I got tickets for Footloose, and I really do recommend seeing Footloose with him as he is a world renowned expert on all things Ren McCormack. The last time I watched it with him was at the Prince Charles Cinema at one of their overnight PJ parties, and I shamefully fell asleep midway through. I’m not sure if he’s forgiven me for that. We were given flip flops before we went into the room because they had filled the whole place with sand, sadly not Liberty print flip flops which was my only criticism. There were about 20 deckchairs set up with little tables full of sweets and popcorn, and we were given a drink when we arrived. It was so satisfying to sit in the deckchair and feel the sand between your toes. Made me really nostalgic for Surfside. I really can’t think of a better place to watch a film. They did such a great job with the staging, and I’m tempted to visit their main location. I’ll definitely keep checking in with them to see what new experiences they come up with. I was not a very worldly teenager. I hadn’t travelled, wasn’t too hot on pop culture or current events, tended to watch whatever my parents watched on TV. You could almost say a bit sheltered. So when I saw Adam Buxton dressed as a Klingon singing a terrible song about Star Trek: The Next Generation, I had no idea what to think. It was so weird to watch intentionally bad TV – Takeover TV was my first real experience of subversive media and I loved it. 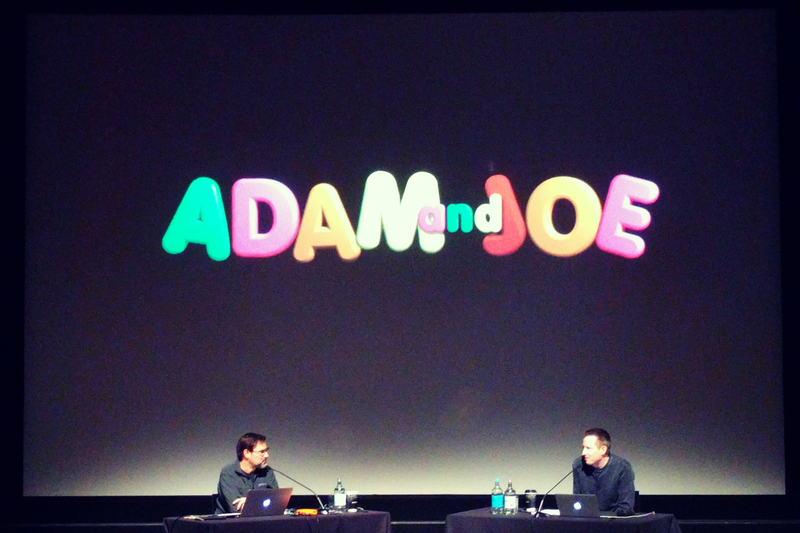 Over the years, I became obsessed with the Adam and Joe Show, and their various stints on radio. So much of their 6 Music show has become ingrained in my life – there are certain links which made me laugh so much that I can picture where I was when I heard them the first time, like squirrelling away in the old filing cabinets at work, or stuck in traffic in Guildford. 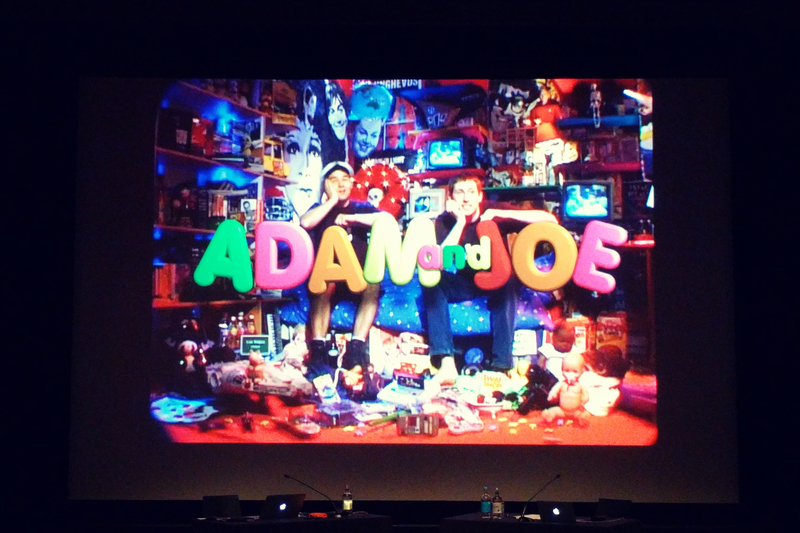 We’ve seen Adam Buxton a bunch of times over the past few years (as documented on the blog), including a visit to BUG last week which I haven’t blogged about as yet. But Joe has always been just out of reach for me – despite the fact he’s done plenty of filmic events over the years, I’ve never seen him (except in Forbidden Planet about 12 years ago. He was buying comics. I was giddy). Adam and Joe together though? I thought it an impossible dream. I could never imagined that I’d go to a live recording of a podcast, and one that celebrated 20 years of their professional partnership. But it actually happened, and I had a hysteria-caused sore throat to prove it. There were two shows on Thursday night, and I am very grateful to Tim for getting us tickets for the first (although if there wasn’t such a thing as a last train home, I would have tried to go to both). It overran by quite an extensive amount which I’m torn about – the audience was privy to some naturally hilarious conversation between the two of them, but when Adam skipped us ahead in his slideshow to get to the end, we saw how much we’d missed out on. Hopefully, the podcast will feature enough of the bits we missed. Whilst it took Joe a few minutes to get comfortable in front of the sold-out crowd, they were both on excellent form and got adorable giggles at Joe’s mime act and Adam’s impression of the Queen. I similarly got the giggles, and by the end of the evening, I had cried the make-up off my face. Plus, I got an Adam and Joe tote bag, which is something I never thought I’d own. The teen version of me would be incredibly jealous. About a year ago, I was stood next to a red carpet, repeating the phrase “it’s a documentary about Scientology” to disinterested tourists who smiled, nodded, and drifted away. I don’t routinely visit red carpets, but had accompanied Husband and Tim who had tickets to the premiere of Louis Theroux’s My Scientology Movie. I did not. I had lingered after they’d gone in, hoping to get the chance to speak to Louis. He chatted to the press for a bit before briefly talking to fans who forced themselves upon him, but it wasn’t to be for me. If you look at the photos from the London premiere, you’ll be able to spot me looking glum in the background, trying to decide if I had time to stop by Tatty Devine on my sad walk back to Waterloo. 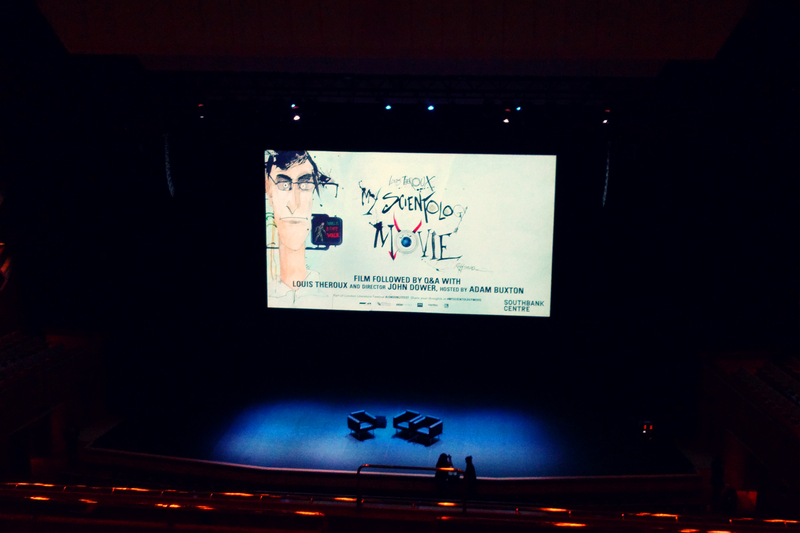 Things have now come full circle, with me attending a screening of the film in the Royal Festival Hall alone, without my two compadres. Circumstances conspired against me, as both Husband and Tim had more exciting things going on, but I couldn’t give up the chance to see the film, plus a Q&A with Louis and director John Dower hosted by Untold Blisses favourite, Adam Buxton. I had low expectations of the film – I’d read a number of reviews which pointed out that the film doesn’t really add anything to the conversation – but I actually really enjoyed it. I’m fascinated by the craziness in the Scientology cult, and have adored Louis since his very first Weird Weekends so I couldn’t not enjoy it. It did feel different to his other documentaries, and the feature-length aspect of it meant that some parts of the story came across as a bit labourious but it there were still brilliant moments to be found. And some moments were downright disturbing, like the joy Marty Rathbun seemed to get out of roleplaying with “David Miscavige”, and the stalking that the ‘church’ does of Louis and his crew. It is a fascinating examination of how closed-off they are – I think Louis more than anyone would be willing to show balance but they clearly don’t want to engage with an audience. It’s a clever perspective for Louis to have – this was just a film about how he couldn’t make a film. Adam Buxton leading the Q&A at the end was a delight. The closeness of his friendship with Louis allowed him to be more candid and less scripted, even at one point accidentally comparing Louis to Miscavige and Jimmy Saville. It was a hilariously awkward moment. I was a bit disappointed that there were no Scientologist outbursts – I had read reports of that happening in earlier screenings, and I was kind of tempted to meet one (I have knowingly met one – Jason Dohring who has the most intense eyes I have ever seen in my life). There was a really odd moment at one stage where a whole host of men in white shirts traipsed out all at the same time which freaked me out a little, but it could have been just a coincidence. I was a tad on edge after that. Next up – the documentary they told Louis they were making about him. Can’t wait for that to be released. My Mother-In-Law always find fascinating things to do in London, and a few weeks ago she mentioned that she’d booked a couple of events for the Heritage Open Days. 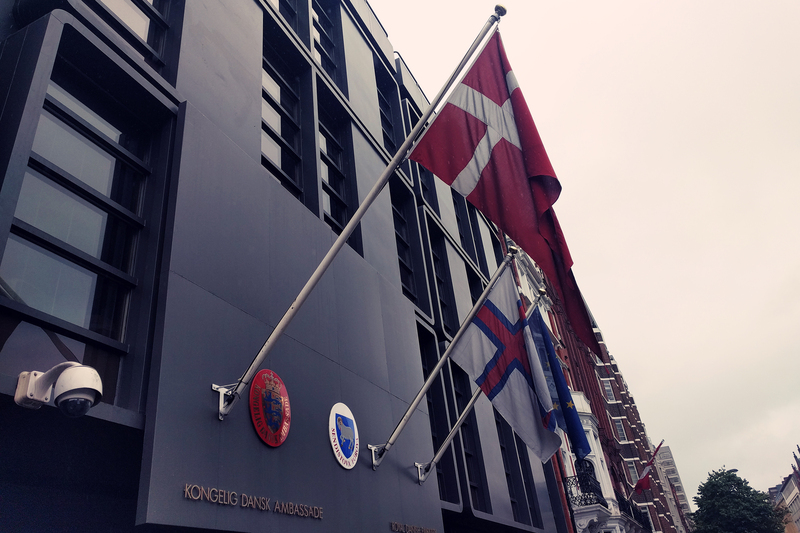 I clicked around the website and saw so many places I wanted to visit, but one immediately jumped out at me – a National Trust tour of the Danish embassy in Sloane Square. The Arne Jacobsen designed modernist building was built in the 1970s, and really doesn’t match anything in the area. Concrete, aluminium, and big boxy shapes look completely out of place, but I love it – it’s so iconic. I can imagine how everyone would have hated it back in the 70s though. The National Trust tour took us round the offices and into the residences of the ambassador at the top. And made me insanely envious. Our visit started with a mini-lecture on modernism and brutalism which was right up my alley. One of the first slides was of the Royal Festival Hall so I knew I was in the right place. We were given a brief history of the building and of Arne Jacobsen’s designs before being split into two groups for the tour. Weirdly, Husband and I noticed that one of our National Trust guides was Eleanor who had taken us round the Southbank Centre last year – even weirder after speaking with her and finding out that she hadn’t run any tours for a year. I felt I had to assure her we weren’t stalking her. I’m sad there wasn’t any smørrebrød on the table to complete the scene. The Ambassador has a beautiful office, with stunning pieces of art and amazing furniture, including the obligatory Swan chair. The other two offices we visited were just as impressive – the offices of the press officer and the cultural attaché. It made me desperately want to be the Danish cultural attaché – she has some beautiful Montana units full of books and ceramics, fabulous chairs, a great desk. In the corridor were posters of Mads Mikkelsen and Pilou Asbæk. Why can’t this be my workplace?! After I had finished making my interior design shopping list (the tour should really had come with a catalogue), we crossed back over the courtyard to visit the ambassador’s residence. We were only allowed into the “public” area of the residence – it would have been a bit unfair for us to traipse through their house, so the floor we saw was where they entertain visitors and host events. I loved all the Danish ornaments dotted around the place – dala horses, Normann Copenhagen bowls, wooden soldiers, even “The Little Book of Hygge” on the piano. They had some pretty amazing furniture and art on this floor as well – pieces painted by the Queen of Denmark and the Ambassador’s wife, Susanne Fournais Grube. I really loved her paintings – she paints maritime scenes which almost look pop arty. And then our tour was over after almost an hour and a half and we said farewell to this extraordinary building. On the walk back to Waterloo, Husband and I tried to figure out a way of getting a job there, but I suspect you have to be Danish. So now we just need to be Danish. I’m sure that’ll be easy.